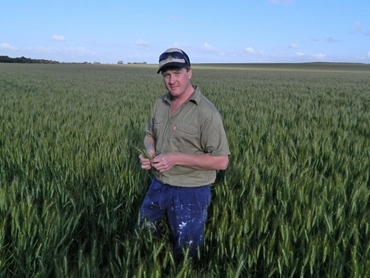 Beverly grower Adam Smith has had a record yield in his wheat crop this January. While Western Australia finished on a record harvest of almost 16 million tonnes by the end of January, Mr Smith’s wheat crop has yielded 60 per cent more than the region’s ten-year average. Mr Smith, along with parents Richard and Di, grew 1000ha of wheat as a portion of their cropping program last year, spread over five varieties including Cobra, Mace and Wyalkatchem. Their best performer, Cobra yielded 3.7t/ha, easily beating their long-term average yield of 2.4t/ha. Protein was 10.1 per cent, almost one per cent higher than the remaining wheat. Mr Smith described the yield as the best result in the history of their family farming business. Of the 220 hectares of Cobra grown, it went about 200kg/ha higher than the rest of their wheat program. The extraordinary year was mostly due to climatic conditions, as WA’s wheat belt experienced some of the best seasonal conditions on record including great rain in the last three months. It wasn’t all straightforward though, according to Mr Smith, with a great start, a shocking middle, and a perfect end. There was very good subsoil moisture at seeding in May and then they didn’t get any rain for July until the 24th, leaving the crop to struggle, but then it came back on for spring. The Cobra received 300mm of growing season rain, with 250mm of it falling across July, August and September. The crop was sown with a minimum till knife point bar air seeder at 70kg/ha with 22cm rows. Fifty kilos of DAP fertiliser was applied at sowing and 80 kilos of urea at early tillering. Going forward, they plan to plant Cobra and Wyalkatchem varieties because they suit the area perfectly. The Smiths’ winter routine involves wheat, barley and canola, and sometimes lupins, and they have the ability each season to use their farm as a testing ground for new varieties. When Mr Smith conducts the on-farm trials, he is focusing on varieties with an early-to-mid season planting window that has a good yield and disease package. Also of note during the 2013 season was Cobra’s extremely good competitiveness on the weed front, especially against ryegrass. He explains the new varieties with better genetics are naturally expected to be better. Mr Smith controlled problem grasses with two different applications. To control the ryegrass, a pre-emergent trifluralin is used at planting, followed by one or two broadleaf sprays for radish. With harvest completed by December 20 and an income budgeted on wheat yields of 2.5t/ha, the family had the best season possible. This winter they will plant 1750ha, including 1000ha of wheat, with most of the ground dedicated to Cobra.